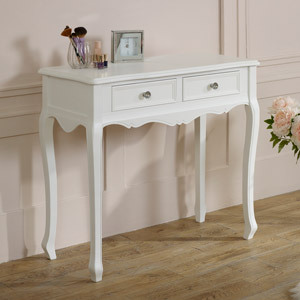 Beautiful white satin painted dressing table with grey velvet upholstered stool. 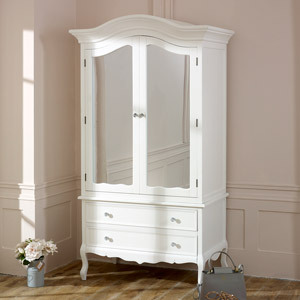 Bedroom furniture for the vintage, French, shabby chic inspired bedroom. Matching furniture available in the Victoria Range. The table features crystal handles for a luxurious, glam and stylish look. 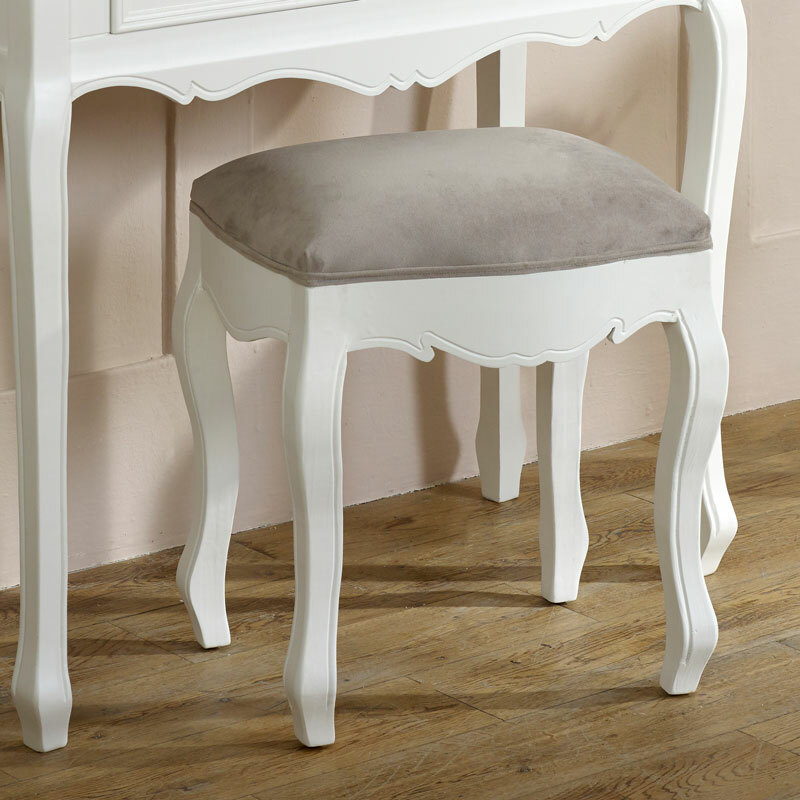 Ornate carved features grace both the table and the stool with a soft grey velvet upholstered seat giving extra comfort. 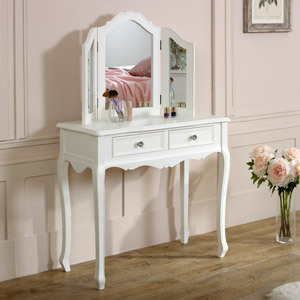 The dressing table features 2 drawers for storage toiletries and bits & bobs. 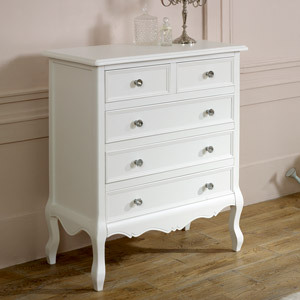 The white finish will easily fit in with any colour scheme. 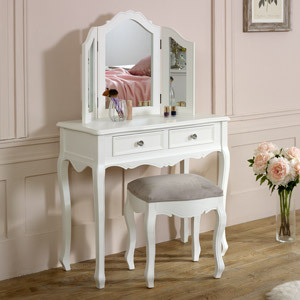 Beautiful white satin painted dressing table with grey velvet upholstered stool. 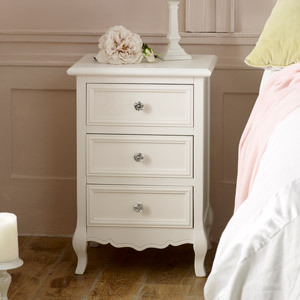 Bedroom furniture for the vintage, French, shabby chic inspired bedroom. Matching furniture available in the Victoria Range. The table features crystal handles for a luxurious, glam and stylish look. Ornate carved features grace both the table and the stool with a soft grey velvet upholstered seat giving extra comfort. 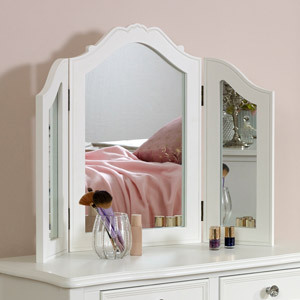 The dressing table features 2 drawers for storage toiletries and bits & bobs. 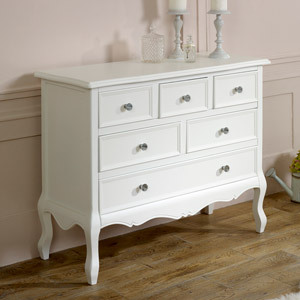 The white finish will easily fit in with any colour scheme. 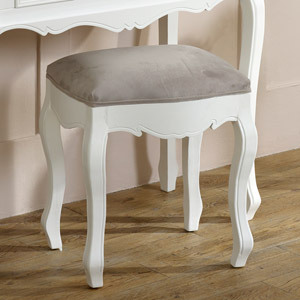 Made from wood and painted in a white satin finish with the stool upgholstered with a soft grey velvet fabric. There is minimal assembly required on the table with just legs to attach, quick and easy to do (fixings included), the stool comes fully assembled.